The lenses will be housed in a metal frame being constructed at Fermi National Accelerator Laboratory (FNAL) to form a minivan-sized stack known as an optical corrector. This device will be the first piece of equipment installed at the Mayall Telescope for DESI in 2018. DESI is supported by the U.S. Department of Energy’s Office of Science; additional support for DESI is provided by the U.S. National Science Foundation, Division of Astronomical Sciences under contract to the National Optical Astronomy Observatory; the Science and Technologies Facilities Council of the United Kingdom; the Gordon and Betty Moore Foundation; the Heising-Simons Foundation; the National Council of Science and Technology of Mexico; the Ministry of Economy of Spain, and DESI member institutions. The DESI scientists are honored to be permitted to conduct astronomical research on Iolkam Du’ag (Kitt Peak), a mountain with particular significance to the Tohono O’odham Nation. Current DESI Member Institutions: Aix-Marseille University; Argonne National Laboratory; Barcelona-Madrid Regional Participation Group; Brookhaven National Laboratory; Boston University; Carnegie Mellon University; CEA-IRFU, Saclay; China Participation Group; Cornell University; Durham University; École Polytechnique Fédérale de Lausanne; Eidgenössische Technische Hochschule, Zürich; Fermi National Accelerator Laboratory; Granada-Madrid-Tenerife Regional Participation Group; Harvard University; Korea Astronomy and Space Science Institute; Korea Institute for Advanced Study; Institute of Cosmological Sciences, University of Barcelona; Lawrence Berkeley National Laboratory; Laboratoire de Physique Nucléaire et de Hautes Energies; Mexico Regional Participation Group; National Optical Astronomy Observatory; Siena College; SLAC National Accelerator Laboratory; Southern Methodist University; Swinburne University; The Ohio State University; Universidad de los Andes; University of Arizona; University of California, Berkeley; University of California, Irvine; University of California, Santa Cruz; University College London; University of Michigan at Ann Arbor; University of Pennsylvania; University of Pittsburgh; University of Portsmouth; University of Queensland; University of Toronto; University of Utah; UK Regional Participation Group; Yale University. For more information, visit desi.lbl.gov. 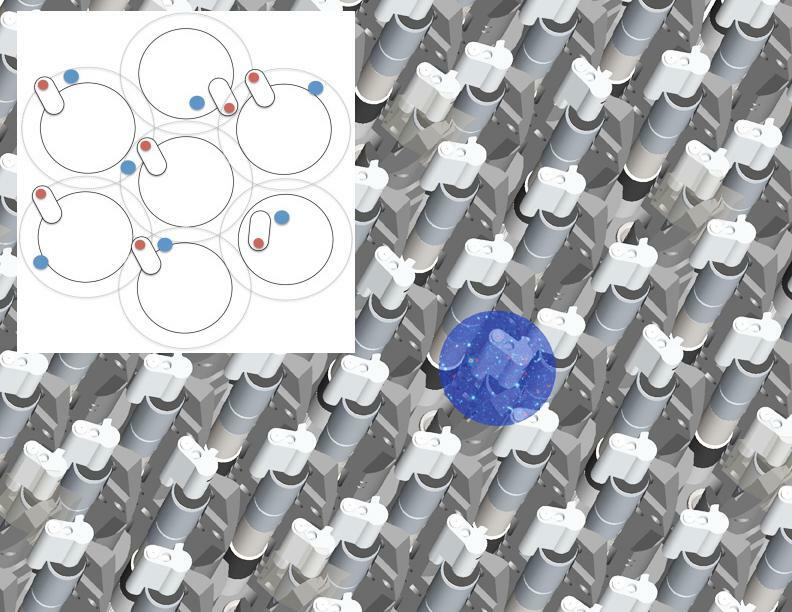 A prototype system, designed as a test for a planned array of 5,000 galaxy-seeking robots, is taking shape at the Department of Energy’s Lawrence Berkeley National Laboratory (Berkeley Lab). The full DESI project, which is managed by Berkeley Lab, involves about 200 scientists and about 45 institutions from around the globe. DESI will provide the most detailed 3-D map of the universe and probe the secrets of dark energy, which is accelerating the universe’s expansion. It is also expected to improve our understanding of dark matter, the infant universe, and the structure of our own galaxy. ProtoDESI will have 10 rodlike robots (above, left)—10 inches long and designed to point fiber-optic cables at sky objects and gather light—and 16 light-emitting devices (middle) to ensure the system is targeting correctly. The ProtoDESI setup (right, with robots and light rods shown in yellow circle) will be tested at the Mayall Telescope in Arizona from August-September. DESI robots (right) will poke out from 10 wedge-shaped “petals” that will be fitted together in a Focal Plate Assembly (left). DESI’s robots can point their fiber-optical cables (red dots, upper left) at any sky object (blue dots) within a 12-millimeter-diameter area. A rendering of the robotic array (right) with an overlay of a star field that can be reached by one robot. 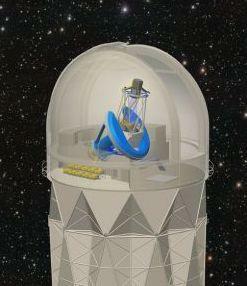 A rendering of DESI inside the Mayall Telescope (left). The robotic array is contained in a gray-shaded structure pointed toward the top of the dome. That requires precise, software-controlled choreography so that the tightly packed robots don’t literally bump heads as they spin into new positions several times each hour to collect light from different sets of pre-selected sky objects. “The main goal of ProtoDESI is to be able to fix fibers on actual objects and hold them there,” said Parker Fagrelius, who is managing the ProtoDESI project at Berkeley Lab. Fagrelius is a UC Berkeley graduate student who is also an affiliate in the Physics Division at Berkeley Lab. ProtoDESI’s robots, assembled at University of Michigan and then shipped to Berkeley Lab, are positioned far enough apart that they won’t accidentally collide during their initial test run. While DESI’s robots will primarily target galaxies, ProtoDESI will use mostly bright, familiar stars to tune its robotic positioning system and ensure the system is accurately tracking with the motion of objects in the sky. 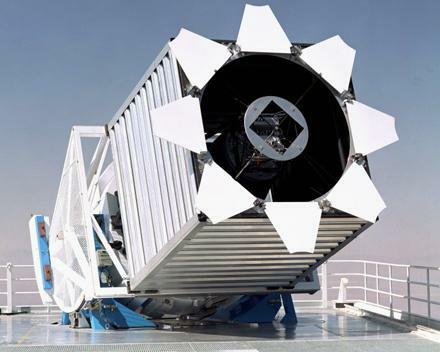 Mounted next to the positioners is a custom digital camera known as the GFA (for guide, focus and alignment) that will remain targeted on a “guide star”—a bright star that will aid the tracking of other objects targeted by the robot-pointed fibers. Several Spanish research institutions in Barcelona and Madrid are responsible for this GFA system. “We’ll choose the fields we look at quite carefully,” Fagrelius said. The robots will initially fix on isolated sky objects so that they don’t mistakenly point at the wrong objects. The fibers carried by the robots each have a core that is 107 microns (millionths of a meter) wide. After repositioning, the fibers will be backlit to project points of light on a camera that can help to fine-tune their individual positions, if needed. Yale University is supplying this fiber-view camera and also the fiducials. Fagrelius will join a team of researchers at Kitt Peak’s 4-meter Mayall telescope in early August to run through a checklist of ProtoDESI tests. About 28 researchers from nine institutions in the DESI collaboration are working on ProtoDESI, including six Berkeley Lab researchers. Researchers will test the auto-positioning system by slightly shifting the pointing of the telescope and the fibers—a process known as “dithering”—to see how the components readjust to find the correct targets. A digital camera will measure light streaming in from the fibers to determine if the robots are properly targeting sky objects. “ProtoDESI will show us how the software and positioners are working together,” Fagrelius said. “All of the things we learn along the way from ProtoDESI will be built back into the plans for DESI’s commissioning.” Some measurements and pre-testing with ProtoDESI will be conducted at Berkeley Lab even before ProtoDESI moves to the Mayall telescope, she added. The full robotic array planned for DESI will be segmented in 10 pie-wedge-shaped “petals” that each contains 500 robots. The first petal will be fully assembled by October at Berkeley Lab and tested at the lab through December. The multi-petal design will allow engineers to remove and replace individual petals. Each robot will have an electronic circuit board and wiring, and on the final DESI project each robot’s fiber-optic cable will be spliced to a 42-meter-long fiber-optic cable that will run to a light-measuring device known as a spectrograph (ProtoDESI will not have a spectrograph). The completed project will feature 10 high-resolution spectrographs, that will measure the properties of objects’ light to tell us about how fast faraway galaxies are moving away from us and their distribution, and will help us trace the universe’s expansion history back 12 billion years. Joe Silber, a Berkeley Lab engineer working on DESI systems that include its robotics, said the fiber-optic cables are among the most sensitive components in DESI. “If there is too tight of a bend or you stress the fiber, it will degrade its performance,” he said, noting that there have already been tests of the repeated bends and twists to the cables caused by the movement of the robots. Over the lifetime of DESI the ends of the fiber-optic cables will be turned almost 200,000 times, he said. Installation of DESI is expected to begin in 2018. Fagrelius said she looks forward to the ProtoDESI run at Mayall. “September will have a lot more clear nights than August. There should be four weeks of decent time that we can get on sky,” she said, and other tests can be conducted even when viewing is obscured by weather. DESI is supported by the U.S. Department of Energy Office of Science; additional support for DESI is provided by the U.S. National Science Foundation, Division of Astronomical Sciences under contract to the National Optical Astronomy Observatory; the Science and Technologies Facilities Council of the United Kingdom; the Gordon and Betty Moore Foundation; the Heising-Simons Foundation; the National Council of Science and Technology of Mexico, and DESI member institutions. The DESI scientists are honored to be permitted to conduct astronomical research on Iolkam Du’ag (Kitt Peak), a mountain with particular significance to the Tohono O’odham Nation. Scientists hope the quarter-ton hunks of glass will help them see dark energy’s effects. The delicate process of lens crafting takes time and care. For your typical prescription eyeglasses, expect two weeks for proper sizing and glare-resistant coating. 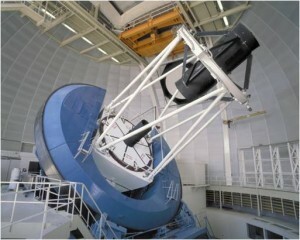 For a four-meter telescope with meter-wide lenses, a similar procedure takes well over a year. The Dark Energy Spectroscopic Instrument project is the latest in a line of sky surveys to obtain custom lenses for an existing telescope. 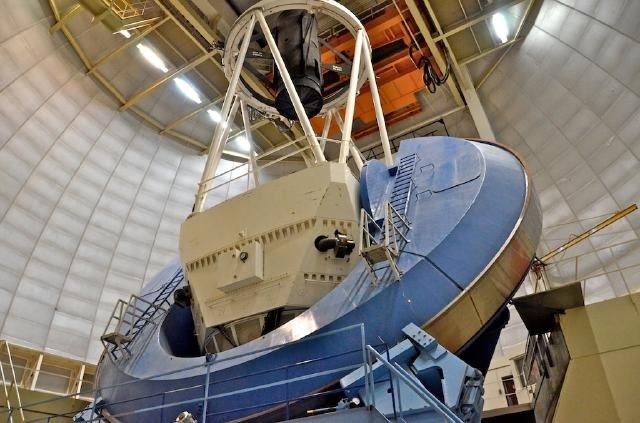 DESI arranged for refurbishments to the Mayall Telescope at the Kitt Peak National Observatory in Arizona, where it will create a three-dimensional map of a third of the sky in a quest to measure dark energy. The upgrade includes six new lenses, the two heaviest of which are ready for a final coating before integration into the brand new corrector barrel. Those nearly complete lenses, Corrector Lens 1 and Corrector Lens 4 (C1 and C4), have been in production since early 2015. Their journey began as a raw chunk of glass. Early last year, a private electro-optical lens company in Pittsburgh began fabricating the two lenses. Machines spun the noncrystalline glass around a central axis while removing material, shaping it into its final form. Each lens is over 1 meter in diameter. “The lenses must be carefully polished to achieve a surface that’s accurate to tens of nanometers, with errors a fraction of a human hair,” says Tim Miller, an optical engineer for DESI and Berkeley Lab. C1 and C4 began production earlier than the other four lenses because they have the tightest specification requirements. This is a consequence of their large size: C1 and C4 weigh in at 444 pounds and 522 pounds, respectively. They’ll eventually work in concert with the two aspherical lenses that correct for defects and a pair of lenses with wedges, which hook to motors and rotate to correct for disturbances on Earth. Once the lenses were precisely shaped, they were ready for the cross-country move to the National Optical Astronomy Observatory in Arizona in January. C1 and C4 shipped in skid-proof crates with burly security straps for the two-day road trip. The padded crates traveled with monitors called “shock loggers,” which measured bumps and vibrations in the road that could damage the lenses. The loggers previously monitored components for the Dark Energy Camera as they were transported for the Dark Energy Survey. The lenses arrived safely at NOAO, but their journey is far from over. The next big operation is applying antireflective coating, a process scheduled for April. Then they’ll head to University College London, where a team will install them in a new steel corrector barrel being fabricated by Fermilab. By early 2018, the entire package will be ready to ship and install into Mayall. DESI will 3D-map most of the northern sky by collecting redshift data from over 35 million distant galaxies and quasars. A spectrograph shows scientists emission lines, or lines on the color spectrum, with colors linked to wavelengths. Depending on how much the lines have shifted toward the red, scientists can determine how far away a celestial body is from us. However, redshifts alone cannot make a perfect three-dimensional map, says Daniel Eisenstein, co-spokesperson for DESI and professor of astronomy at Harvard University. “When we collect the spectra of galaxies in DESI, we are making a 3D map, but it only shows relative distances. It’s as if we have a detailed map of the United States with no scale,” he says. DESI scientists use baryon acoustic oscillations, subtle correlations in the way galaxies are spread throughout the cosmos, to infer the scale of the map and our distance from those galaxies. DESI’s precise measurement of that changing distance may reveal how dark energy acts on the universe. This spectroscopic survey is the next innovation of telescopic observation. Because of the difficulty of 3D mapping large parts of the sky, high-performance optics with a wide field of view are essential. A newly upgraded camera that incorporates light sensors developed at the U.S. Department of Energy’s Lawrence Berkeley National Laboratory (Berkeley Lab) is now one of the best cameras on the planet for studying outer space at red wavelengths that are too red for the human eye to see. Very distant astronomical objects appear much redder when observed on Earth due to an effect known as redshift, so this sensitivity to red light enables the camera to detect objects many billions of light years away. The camera has begun its two-year mission to quickly survey the sky, amassing images of hundreds of millions of galaxies and stars. Mosaic-3 will capture images nearly twice as fast as its predecessor camera, and can see galaxies 10 times fainter than those detected in a previous survey called the Sloan Digital Sky Survey [SDSS]. Mosaic-3 is the product of a small collaboration of scientists and engineers at Berkeley Lab, Yale University, and the National Optical Astronomy Observatory (NOAO). It will help to scout out galaxies that can be targeted for further observations by DESI, the Dark Energy Spectroscopic Instrument, which is scheduled to be installed on the Mayall telescope in 2018. DESI, which will be built by a Berkeley Lab-led collaboration, will produce a 3-D map of the universe out to a distance of 12 billion light years. By measuring the velocities of millions of galaxies and extremely bright and distant objects known as quasars, DESI will chronicle the expansion history of the universe to unprecedented precision. It will yield a better understanding of “dark energy,” a mysterious form of energy that is causing this universal expansion to accelerate. Mosaic-3’s primary mission is to carry out a survey of roughly one-eighth of the sky (5,500 square degrees). This survey, known as the Mayall z-Band Legacy Survey (MzLS), will span about 220 nights of observations this year and next, and all of the camera’s data will be immediately available to the public. During the remaining nights, Mosaic-3 will be available to astronomers for other research. 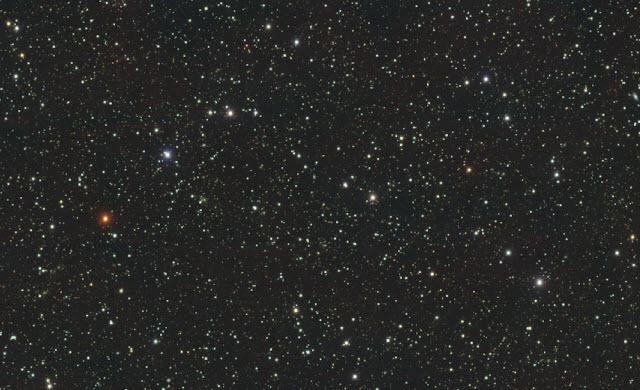 The z-band survey is just one layer in the galaxy survey that is locating targets for DESI. Data from this survey are being combined with data from other telescopes to produce images of galaxies in many colors, and the combined data will be publicly released twice per year on the Legacy Survey website. The Mosaic-3 camera is an upgrade that brings new cutting-edge sensors developed at Berkeley Lab to an existing, decade-old camera at the Mayall Telescope. The cryostat (a device used to maintain a supercool temperature) from this camera was refurbished to incorporate the new light sensors, and the electronics were replaced. The piece of glass used as Mosaic-3’s filter for gathering infrared light appears perfectly black to the naked eye but transmits 98 percent of the incoming infrared light at the wavelengths it is scanning. Berkeley Lab supplied the charge-coupled devices (CCDs) that capture light and the readout system that translates the light into images, and Yale was responsible for new mechanical components and software. David Rabinowitz at Yale oversaw the software development, working closely with NOAO astronomers and engineers. Mosaic-3 is equipped with four CCDs, each measuring about 6 square inches and containing 16 megapixels. Each pixel in the CCDs is about 100 times larger in area than a pixel in an iPhone 6 camera sensor, and each Mosaic-3 CCD is about 50 times larger in area than the iPhone 6 camera sensor. “It’s really the light-gathering power that matters,” said Armin Karcher, a Berkeley Lab design engineer who built a compact, flexible readout system for the camera. The large pixel size and overall CCD size are key in gathering light, and the 0.5-millimeter thickness of the CCDs helps the CCDs see deeper into the infrared wavelengths. Steve Holland, an engineer at Berkeley Lab who invented these red-sensitive CCDs, said he was already engaged in the design of similar CCDs for the DESI project when Mosaic-3 launched. “It was serendipitous,” he said. Christopher Bebek, who manages Berkeley Lab’s CCD group and served as the lab’s liaison on the Mosaic-3 project, added, “This was like a dress rehearsal for detectors and electronics for DESI.” An updated CCD design is now in production for DESI, which will require 20 of these CCDs for its spectrograph system. The Mosaic-3 instrument upgrade was funded by the U.S. Department of Energy Office of Science through the DESI project, and by NOAO. The DESI project is managed by the Lawrence Berkeley National Laboratory. For more information about DESI, go here. 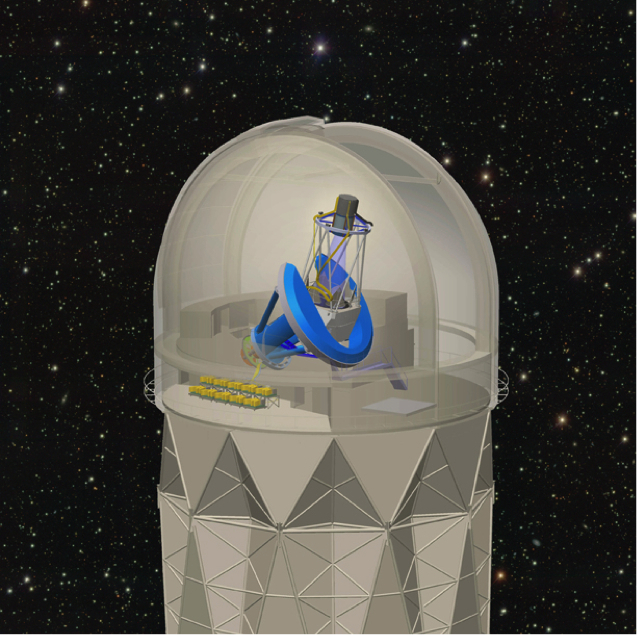 The DESI redshift survey will richly complement other aspects of DOE’s interest in dark energy, including partnerships with NSF in such imaging surveys as the ongoing Dark Energy Survey, which uses the Dark Energy Camera on the Blanco telescope in Chile (the Mayall telescope’s South American twin), and the Large Synoptic Survey Telescope under construction in Chile [being built under the direction of SLAC] , whose run is scheduled to start in 2021. DESI traces its heritage to the Baryon Oscillation Spectroscopic Survey (BOSS) of the Sloan Digital Sky Survey [SDSS], but in number of galaxies and volume of space surveyed, DESI will be more than 10 times bigger than BOSS. The DESI Project is funded by the U.S. Department of Energy, Office of Science; additional support has been provided by the U.S. National Science Foundation, the Gordon and Betty Moore Foundation, the Heising-Simons Foundation, the Science and Technologies Facilities Council of the United Kingdom, the Consejo Nacional de Ciencia y Tecnología, Mexico, the Chinese Academy of Sciences, and the DESI Membership from: Aix-Marseille University; Argonne National Laboratory; Barcelona-Madrid Regional Participation Group; Brookhaven National Laboratory; Boston University; Carnegie Mellon University; CEA-IRFU, Saclay; China Participation Group; Cornell University; Durham University; École Polytechnique Fédérale de Lausanne; Eidgenössische Technische Hochschule, Zürich; Fermi National Accelerator Laboratory; Granada-Madrid-Tenerife Regional Participation Group; Harvard University; Korea Astronomy and Space Science Institute; Korea Institute for Advanced Study; Institute of Cosmological Sciences, University of Barcelona; Lawrence Berkeley National Laboratory; Laboratoire de Physique Nucléaire et de Hautes Energies; Mexico Regional Participation Group; National Optical Astronomy Observatory; Siena College; SLAC National Accelerator Laboratory; Southern Methodist University; Swinburne University; The Ohio State University; Universidad de los Andes; University of Arizona; University of California, Berkeley; University of California, Irvine; University of California, Santa Cruz; University College London; University of Michigan at Ann Arbor; University of Pennsylvania; University of Pittsburgh; University of Portsmouth; University of Queensland; University of Toronto; University of Utah; UK Regional Participation Group; Yale University. For more information, visit desi.lbl.gov. 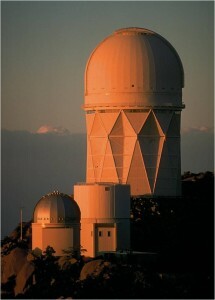 The National Optical Astronomy Observatory (NOAO) is the national center for ground-based nighttime astronomy in the United States (http://www.noao.edu) and is operated by the Association of Universities for Research in Astronomy (AURA) under a cooperative agreement with the National Science Foundation Division of Astronomical Sciences. Established in 2007 by Mark Heising and Elizabeth Simons, the Heising-Simons Foundation (www.heisingsimons.org) is dedicated to advancing sustainable solutions in the environment, supporting groundbreaking research in science, and enhancing the education of children. The Gordon and Betty Moore Foundation, established in 2000, seeks to advance environmental conservation, patient care and scientific research. The Foundation’s Science Program aims to make a significant impact on the development of provocative, transformative scientific research, and increase knowledge in emerging fields. For more information, visit http://www.moore.org. The Science and Technology Facilities Council (STFC) of the United Kingdom coordinates research on some of the most significant challenges facing society, such as future energy needs, monitoring and understanding climate change, and global security. It offers grants and support in particle physics, astronomy and nuclear physics, visit http://www.stfc.ac.uk. 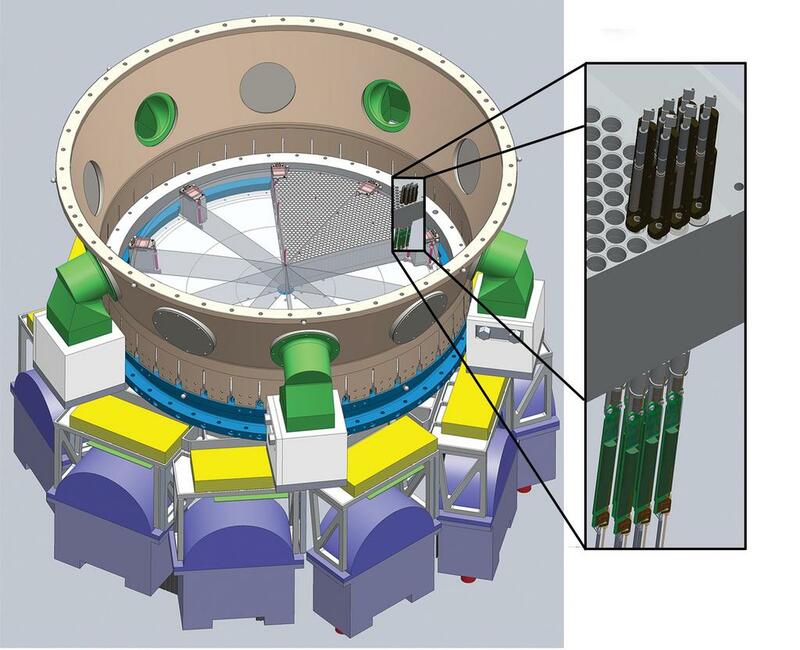 The Dark Energy Spectroscopic Instrument will produce a 3-D space map using a ‘hive’ of robots. Five thousand pencil-shaped robots, densely nested in a metal hive, whir to life with a precise, dizzying choreography. Small U-shaped heads swivel into a new arrangement in a matter of seconds. This preprogrammed routine will play out about four times per hour every night at the Dark Energy Spectroscopic Instrument. The robots of DESI will be used to produce a 3-D map of one-third of the sky. This will help DESI fulfill its primary mission of investigating dark energy, a mysterious force thought to be causing the acceleration of the expansion of the universe. 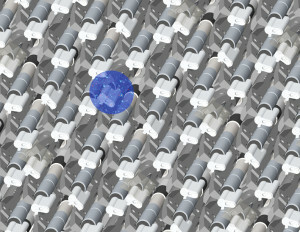 The tiny robots will be arranged in 10 wedge-shaped metal “petals” that together form a cylinder about 2.6 feet across. They will maneuver the ends of fiber-optic cables to point at sets of galaxies and other bright objects in the universe. DESI will determine their distance from Earth based on the light they emit. DESI’s robots are in development at Lawrence Berkeley National Laboratory, the lead in the DESI collaboration, and at the University of Michigan. The robots—each about 8 millimeters wide in their main section and 8 inches long—will be custom-built around commercially available motors measuring just 4 millimeters in diameter. This type of precision motor, at this size, became commercially available in 2013 and is now manufactured by three companies. The motors have found use in medical devices such as insulin pumps, surgical robots and diagnostic tools. At DESI, the robots will automate what was formerly a painstaking manual process used at previous experiments. At the Baryon Oscillation Spectroscopic Survey, or BOSS, which began in 2009, technicians must plug 1000 fibers by hand several times each day into drilled metal plates, like operators plugging cables into old-fashioned telephone switchboards. “DESI is exciting because all of that work will be done robotically,” says Risa Wechsler, a co-spokesperson for DESI and an associate professor of the Kavli Institute for Particle Astrophysics and Cosmology, a joint institute of Stanford University and SLAC National Accelerator Laboratory. Using the robots, DESI will be able to redirect all of its 5000 fibers in an elaborate dance in less than 30 seconds (see video). “DESI definitely represents a new era,” Wechsler says. In addition to precisely measuring the color of light emitted by space objects, DESI will also measure how the clustering of galaxies and quasars, which are very distant and bright objects, has evolved over time. It will calculate the distance for up to 25 million space objects, compared to the fewer than 2 million objects examined by BOSS. The robots are designed to both collect and transmit light. After each repositioning of fibers, a special camera measures the alignment of each robot’s fiber-optic cable within thousandths of a millimeter. If the robots are misaligned, they are automatically individually repositioned to correct the error. Each robot has its own electronics board and can shut off and turn on independently, says Joe Silber, an engineer at Berkeley Lab who manages the system that includes the robotic array. 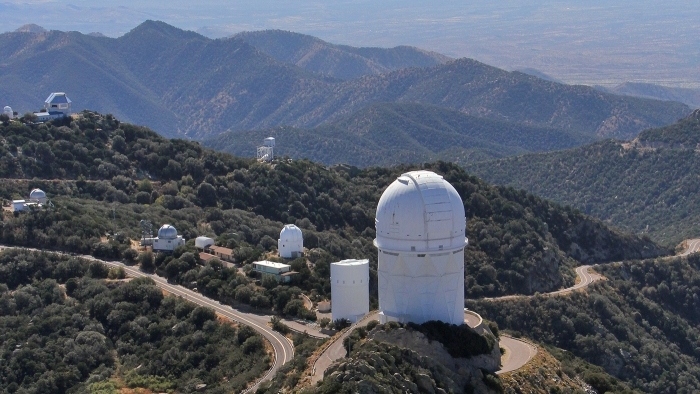 The plan is for DESI to begin a 5-year run at Kitt Peak National Observatory near Tucson, Arizona, in 2019. Berkeley and Michigan scientists plan to build a test batch of 500 robots early next year, and to build the rest in 2017 and 2018. For the past several years, scientists at the U.S. Department of Energy’s Lawrence Berkeley National Lab (Berkeley Lab) have been planning the construction of and developing technologies for a very special instrument that will create the most extensive three-dimensional map of the universe to date. Called DESI for Dark Energy Spectroscopic Instrument, this project will trace the growth history of the universe rather like the way you might track your child’s height with pencil marks climbing up a doorframe. But DESI will start from the present and work back into the past. Michael Levi and David Schlegel, physicists at Berkeley Lab, have been key players in DESI from the beginning. The LBNL news office sat down to discuss the future of the project and how this forthcoming map will help scientists better understand dark energy. What does it mean to make a 3D map of the universe and how big will it be? Michael Levi: To start, DESI will use 2D imaging surveys to pick tens of millions of galaxies to study. Then the DESI instrument will give us redshifts of about 25 million galaxies. The redshifts are what gives you the depth information. David Schlegel: The size of this survey will be huge. In the first five years of operation, we will have measured the distance to more galaxies than previously measured by all other telescopes in the world combined. How does the redshift give you the depth information? ML: We’re collecting spectra, or wavelengths of light, from galaxies. From the spectra, we get a galaxy’s redshift, the ratio of the wavelength we see, to the wavelength the light had when it left the galaxy. The light will stretch exactly the way the universe stretches. For some galaxies, we look for light that starts with a wavelength of 373 nanometers. If we then see it at 746 nanometers, we know the universe stretched by a factor of 2 while the light was making its way to us. What kind of telescope collects this kind of spectra? DS: We’re actually retrofitting a 4-meter telescope at Kitt Peak in Arizona called the Mayall telescope. We’re adding enormous lenses that give a huge field of view. A set of 5000 optical fibers, each like the ones used for long-distance Internet connections, are used to pick off light from up to 5000 galaxies at a time. The fibers direct light to the 30 cameras and spectrographs we have connected to the whole rig. We’ll observe these galaxies for about 20 minutes, then we will point the telescope in a new direction and 5000 little robots will rearrange these fibers to look at a new collection of up to 5000 galaxies, one fiber per galaxy. In other words, the positions of the optical fibers mimic the positions of the galaxies so that each fiber collects light from one galaxy. Point the telescope in a different direction and the fibers need to take on a new configuration. ML: The telescope was built like a battleship in the 1970s, and one of the advantages of this venerable telescope is that it can support the weight of these instruments, which weigh as much as a school bus. This heavy equipment would overwhelm a modern telescope. How much of the sky will DESI be able to see? ML: You can’t see through the Milky Way—its dust cuts out about a third of the sky. So it works out that from one spot on earth, you can see about one third of the sky. DS: If we had another telescope in the southern hemisphere, we could get another third of the sky. But as it is, we’re expecting DESI to see 20 to 30 million galaxies, looking out over a distance of about 10 billion light years. The universe is 13.7 billion years old, and so at a distance of 10 billion light years, we’re looking back in time some 70 percent of the age of the universe. The map from DESI will be both much larger than any previous map and extend much further into the past. Aside from virtual tours of our universe, what scientific purpose does a map like this have? How do we use it to understand dark energy? ML: What we know is that dark energy, which was discovered in 1998, seems to be responsible for the present accelerating expansion of the universe. But we still don’t know what it is, and we also haven’t made very good measurements of it. A project called BOSS started to scratch the surface of this question using spectroscopic techniques similar to DESI’s. Other imaging surveys like the Dark Energy Survey and the Large Synoptic Survey Telescope measure dark energy in a different way, by observing how matter that lies between observed galaxies and us distorts that light. All of these projects are working together to better understand what dark energy actually is. Once we have our very large and very precise map from DESI, we can measure the distances between pairs of galaxies. These distances enable us to track the expansion of the universe. More than that, the 3D clustering of the galaxies lets us calculate the gravitational field between them, testing how cosmic structure grew over time. It can even check whether Einstein’s theory of gravity works in both the early and late universe. Has the universe always been expanding like it is today? DS: In the early universe, dark energy didn’t dominate like it does now and we believe that the expansion was slowing down then. But we only have one data point from that time. All the other data we have is when the universe’s expansion was speeding up, thanks to dark energy. ML: Maybe the expansion speed comes and goes, but our data are not sufficient to tell us. Where does DESI come in? DS: DESI helps us understand the accelerating universe through the structure of this 3D map because the features on this map—the positions and clusters of galaxies—could vary significantly as we look deeper into the universe. For instance, the map close to us is stretched out a lot more than it should be because of this acceleration due to dark energy. And then in the early universe, when there’s not as much dark energy, it shouldn’t be as stretched out, but this is where we don’t have much data yet. Depending on when dark energy was pushing the universe apart, it will push apart different parts of the map. This data will help us eliminate a number of theories about the way dark energy works. What’s Berkeley Lab’s role in all this? DS: We’re running the construction project. We’ve also raised the money for the large corrector optics, which are in the process of being made. We’re designing and manufacturing two-thirds of the CCD cameras used in the spectrographs. And we’re designing and building miniaturized electronics and actuators for the robotic elements that automate the positions of the fiber optics. Also, our supercomputing center, NERSC, is handling the hundreds of terabytes of data DESI will produce. How many researchers and institutions are involved in DESI and who’s funding it? ML: The U.S. Department of Energy is expected to provide the majority of the project construction funds with additional contributions from the UK, France, Switzerland, and Spain. We have 180 collaborators from 25 institutions. DESI’s very fortunate to have donations from the Heising-Simons Foundation and the Gordon and Betty Moore Foundation, and support from the Science and Technology Facilities Council in the UK. We’re also supported by the National Optical Astronomy Observatory. DS: We’re releasing the first data from the initial 2D map of the sky that will identify the galaxies that will be the targets for our spectroscopic measurements once DESI is built. This preliminary survey contains a huge amount of data, and we’re still just getting warmed up. In March, we passed a “CD-1 review,” an early stage “critical decision” process by the DOE’s Office of Project Assessment that tracks the progress on projects. We’ll start installation at Kitt Peak in 2017, and we’re aiming for first light by the end of 2018.